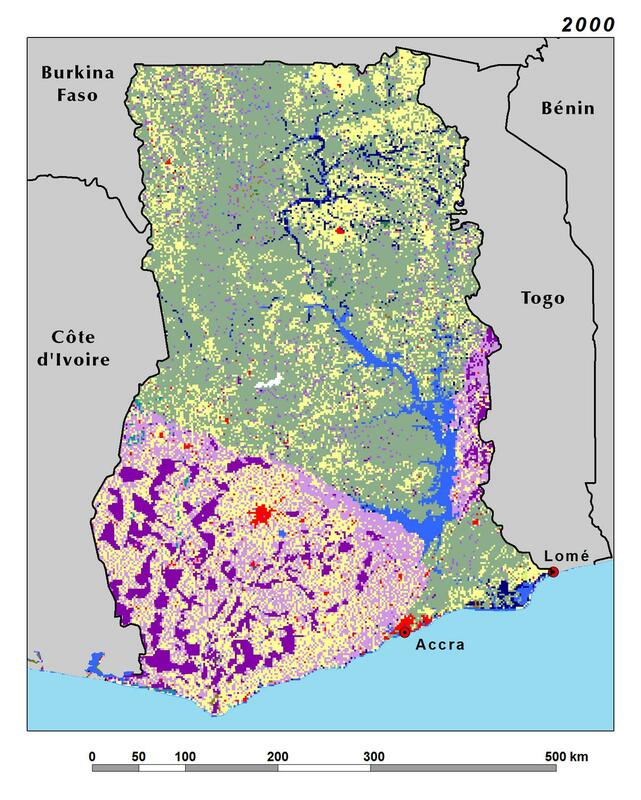 The most obvious land cover change in Ghana is the major increase in agricultural land in all regions of the country. However, the largest increases can be seen in the northeast, east-central, and southwestern regions of Ghana. This rate of agricultural expansion is unprecedented in the country’s history, overrunning many of the other land cover types, including Ghana’s savannas, woodlands, and forests. From 1975 to 2000, agricultural lands expanded from 13 to 28 percent of Ghana’s total area. In just the years from 2000 to 2013, agriculture continued to expand rapidly, reaching 32 percent of Ghana’s land area. This expansion has significance beyond the simple area numbers. Agricultural lands often represent a radical transformation from a diverse variety of vegetation types and natural habitats to crop-dominated landscapes. In Ghana, savannas experienced a large loss, from about 51 to 40 percent of the total land area from 1975 to 2013. The formerly uninterrupted savanna landscapes of the Central Sudan Savanna, Main Transitional Zone, and Central Transitional Zone are now highly fragmented, with large tracts of natural habitat broken into myriad patches of farmland, reducing habitat suitability for many types of wildlife. Another important land cover change in Ghana is the degradation of forest. 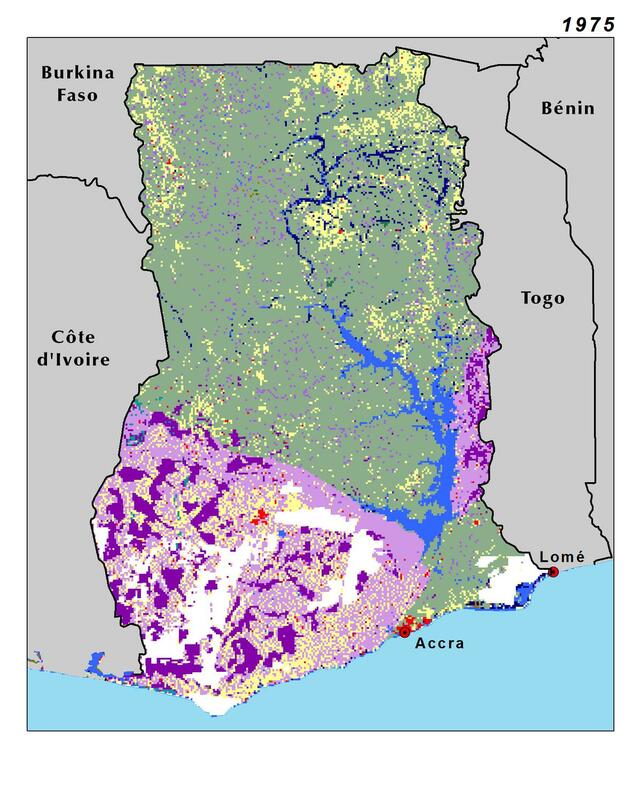 The forest class (represented primarily by Ghana’s dense evergreen rain forest and moist deciduous forest) shows a small decline in area from about 16,400 sq km in 1975 to 15,500 sq km in 2000, a reduction of 5 percent. This decline accelerated rapidly between 2000 and 2013, as forests were reduced by an additional 20 percent, to 12,400 sq km in 2013. The degraded forest, which occurs mainly in the off-reserve areas, represents a vegetation type that was derived from the dense and deciduous forests, modified by human activity. The traditional slash-and-burn method of agriculture, logging, annual wildfires, and recently commissioned open cast mining are the major disturbing factors that have diminished vegetation extent and composition in the southern ecoregions. Degraded forests continued to decrease in area, losing 17 percent of their cover between 1975 and 2013. The expansion of cocoa farms, other crops, and fallow lands represents the primary driver of the decline in degraded forest area. The gallery forest, which represents the most biologically rich habitat in the savanna zones of central and northern Ghana, also experienced a decline that has accelerated, mainly because of clear-cutting for agriculture, from 6,200 sq km in 1975 to 3,750 sq km in 2013. If we add all forest classes together, we see a significant decline of 25 percent of forests over the 38-year period. However, historical imagery confirms that a much larger loss of forest occurred during the 1960s. What remains today is primarily contained in the biological reserves. Ghana is continuing to lose its forest resources at an unsustainable rate. 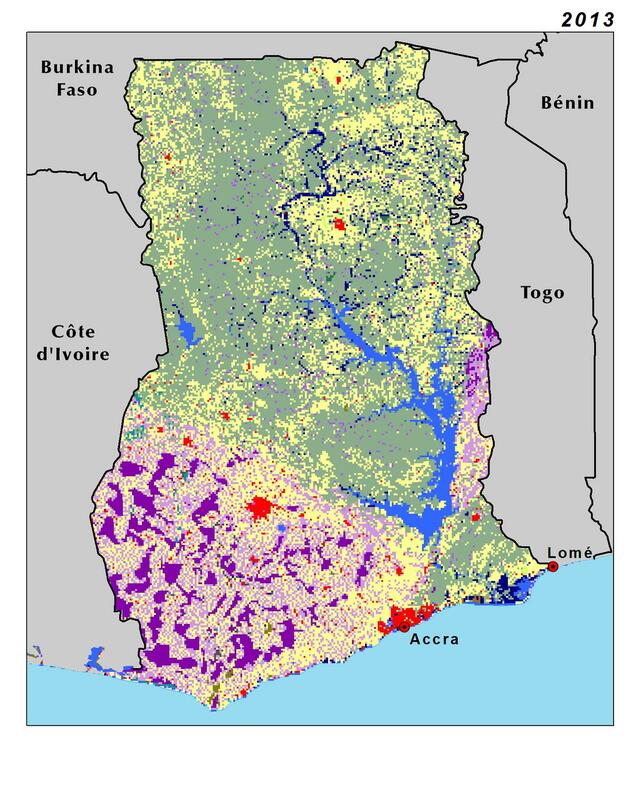 Ghana’s rapid population growth is reflected in the rapid expansion of the Settlements land cover class. From 1,460 sq km in 1975, urban areas expanded to 2,560 sq km in 2000 and 3,830 sq km in 2013, a 161 percent increase over 38 years. The greater Accra metropolitan area has about 4 million people, Kumasi just over 2 million, and Tamale about 370,000 (GSS, 2013).